Photo Credit: Suzanne Dechillo for the New York Times. 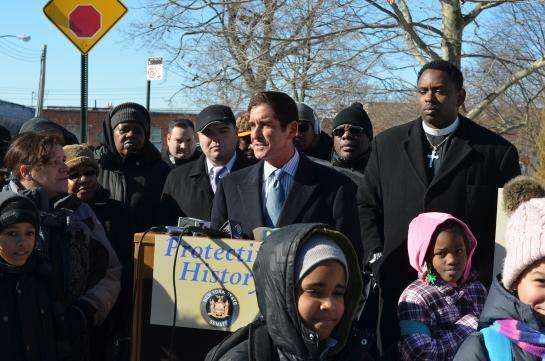 New York State Senator Jeffrey D. Klein held a press conference at the site of the Hunts Point Slave Burial Ground (HPSBG) on Friday, January 24, 2014. Senator Klein said, "For over 100 years, the sacred African slave burial ground in Drake Park has been treated as anything but- with grass, asphalt and dirt covering the historic remnants of slaves in this area. The lives of the men, women, and children who rest in peace here are part of the history of not only the Hunts Point community, but of New York at large. With the recent discoveries made by the students at P.S. 48 at Drake Park, it is critical that we take action to prevent this site from further damage or desecration." The press conference and "recent discoveries made by the students at P.S. 48 at Drake Park" were covered by local and national media outlets in English and Spanish. The Bronx Times: "Ceremony for Slave Burial Ground"
Hunts Point Express: "Students Uncover Secret of Drake Park"
Hyperallergic: "Museum Archive Leads Bronx Students to Forgotten Slave Burial Ground"
Gothamist "South Bronx Students Uncover Slave Burial Ground In Hunts Point"
The New York Times: "South Bronx Students May Have Found Site of Slave Burial Ground"
Bronx News Channel 12: "P.S. 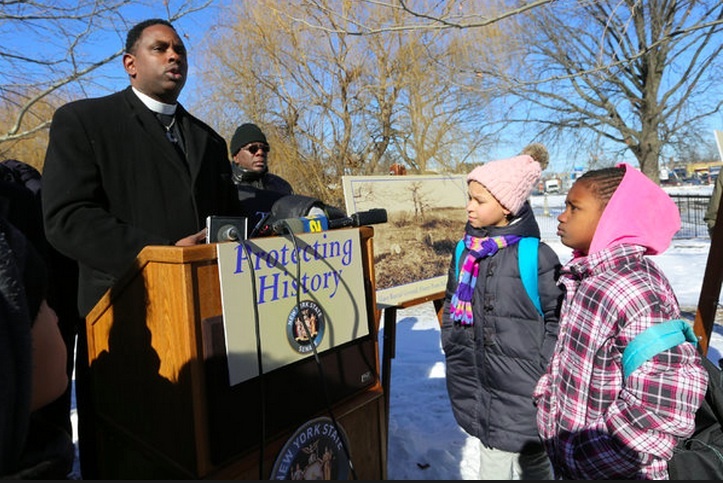 48 Students Discover Slave Burial Ground in Hunts Point"
NY1: "Officials Want Official Recognition for Part of Bronx Park Where Slaves Are Buried"
NY1 Noticias: "Solicitan la protección de una zona tras un hallazgo histórico en El Bronx"